Portfolios of funds with lower risk and with higher yields are constructed for retirement income. Three Model Portfolios have average annual returns of 5.7% to 9.8% during the past three years with yields of 2.5% to 3.0%. The maximum drawdown is 1.4% to 5.2% compared to 13.5% for the S&P 500 for the past three years based on monthly returns. A link to Portfolio Visualizer is provided so that readers can adjust the Model Portfolios to their preferences and risk tolerance. The above article then goes on to say that three Morningstar Mutual Fund Bucket Portfolios are yielding about 2.7%. Portfolio Visualizer is a great tool for backtesting portfolios on a pre-tax basis, but doesn't include target yields for income, nor the tax efficiency of the portfolio. For this article, I screened mutual funds and exchange traded funds for each Lipper Category using Mutual Fund Observer. Criteria was risk (Ulcer Index), risk-adjusted returns (Martin Ratio), and dividend yield. I then used Portfolio Visualizer to create three portfolios with varying amounts of volatility (standard deviation). Below are Lipper Categories selected using my constraints and personal preferences. 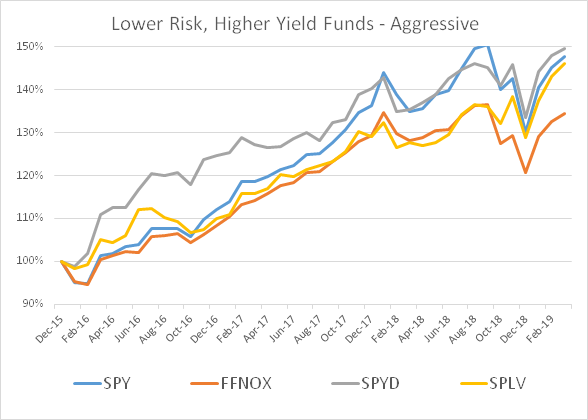 Top Funds based on risk, risk-adjusted returns, and risk-adjusted yields are shown below. The complete list can be found in this attachment: High_Risk_Adjusted_Yields. I divided the yield by the Ulcer Index to show the yield for the risk taken. Chart #1 is the Efficient Frontier for funds that had a higher yield than the S&P 500 during the last bear market (2007 to 2009). Only bond funds did well. By comparison, the S&P 500 lost 21.8% on an annual basis which was worse than about 85% of the higher yielding funds. 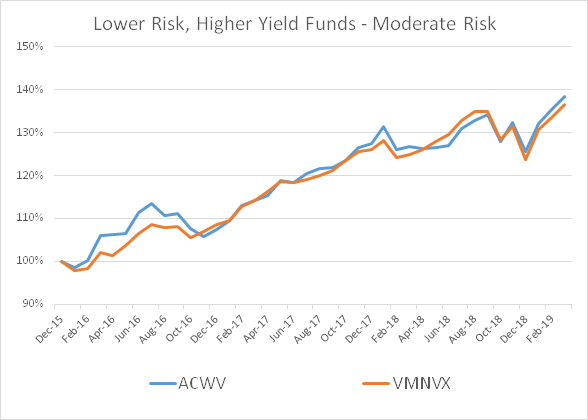 High-Yielding bond funds such as Vanguard High Yield Corporate Bond Fund (VWEHX) also lost a small percentage, but fared better than high dividend stocks. Higher dividends provided little protection for stocks. For me, capital preservation is more important than income during a severe bear market. These Model Portfolios attempt to provide lower drawdown and higher returns, the best of both worlds. Vanguard Intermediate-Term Treasury (VFITX) returned nearly 9% on an annual basis during the 21-month period shown in the Efficient Frontier. It currently has a yield of 2.2%. Chart #2 shows the fund universe loaded into Portfolio Visualizer for the time period November 2015 through March 2019. Each recession is different, so I prefer using recent metrics from Mutual Fund Observer and Portfolio Visualizer to get an idea how they will behave in the next major bear market. Chart #3 shows how the same funds have performed during the past 15 months when stocks went through a mild bear market. 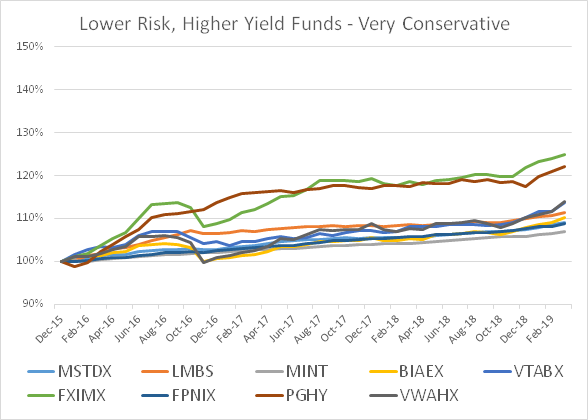 The Funds selected as lower risk, higher risk-adjusted return, higher yield funds are shown below. From Morningstar, the table below shows how the funds are rated and have performed. Most funds have an Analyst Rating of Bronze or higher (not shown). The table below is based on data from Mutual Fund Observer. The Ulcer Index is a measure of the length and duration of draw downs. The Martin Ratio is a measure of Risk-Adjusted Returns. I read about how corporate bonds have become riskier as corporations increase the amount of debt. I believe this to be true, but also believe that bonds will fare better than stocks in a recession. These portfolios are biased toward higher quality, intermediate-term debt. 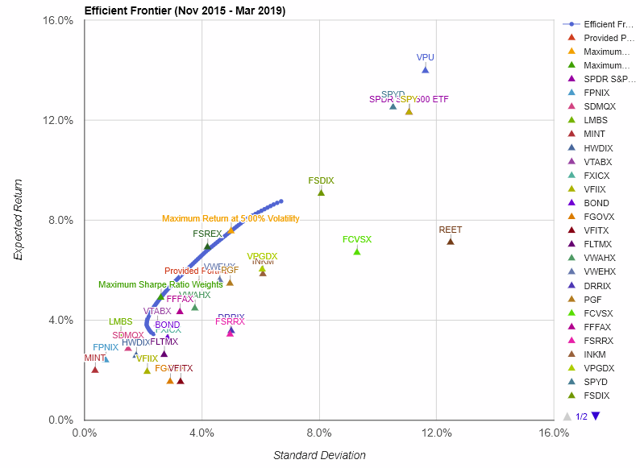 Charts #4 through #7 show how the funds by Risk Category have performed. The two Moderate Risk funds in Chart #6 are Global. One US Equity Funds with a Moderate Risk Rating that appeals to me is Fidelity Strategic Dividend & Income (FSDIX). I created three model portfolios based on maximizing the Sharpe Ratio (25% stock) or maximizing returns at 5% (50% stock) and 7% (70% stock) volatility, using constraints based on my personal preferences. 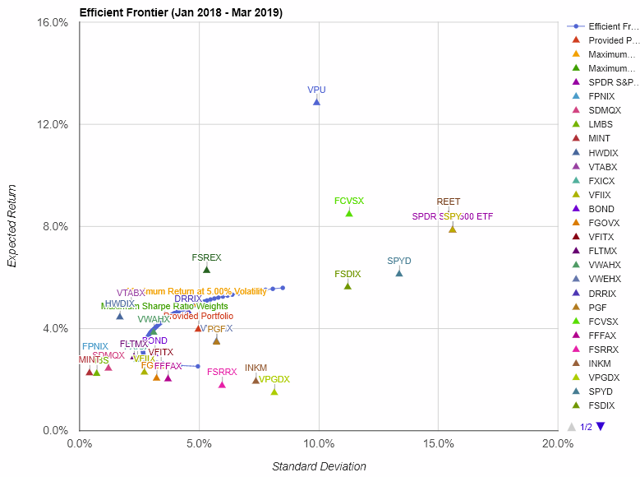 I compare these to the Fidelity Four-in-One Index fund (FFNOX) which is an aggressive, balanced fund of funds and to the Vanguard Wellesley Income Fund (VWIAX) which is a more conservative fund. Each month $3,333 (approximately 4%) is withdrawn from the four Portfolios. I build my Bucket Approach around the Mutual Fund Observer Risk Classification to avoid concentration and maintain diversification. The Fidelity® Four-in-One Index Fund has an allocation of 48% to the S&P 500, 12% Dow Jones U.S. Completion Total Stock Market Index, 25% MSCI EAFE Index, and 15% Bloomberg Barclays U.S. Aggregate Bond Index. 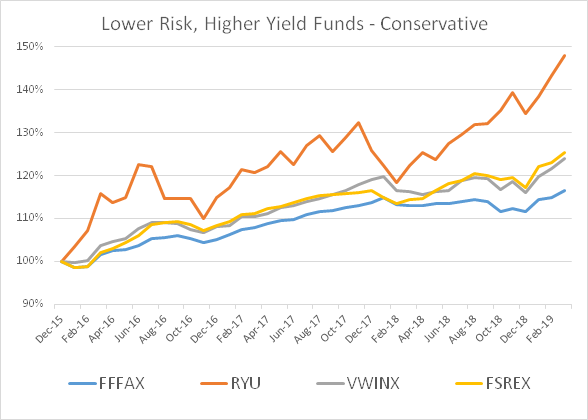 Chart #4 contains the three model portfolios compared to the aggressive Fidelity Four-in-One Index fund (FFNOX) and the conservative Vanguard Wellesley Income Fund (VWIAX). During a recession, the 25% Stock Portfolio is likely to outperform the other four. For an investor looking for a long-term buy and hold portfolio of low risk funds with higher dividends then something along the lines of the 50% Stock Portfolio may be more appropriate. Interested Readers can change allocation in the Portfolio Visualizer Backtest Tool to test their own preferences through this link. Below are the allocations to the funds for each of the Model Portfolios along with the dividend yield and Tax Cost Ratio. The dividend yield is the SEC Yield from Morningstar, and if it was not available then the trailing 12-month yield was used. Morningstar's description of the 3-Year Tax Cost Ratio is shown below. 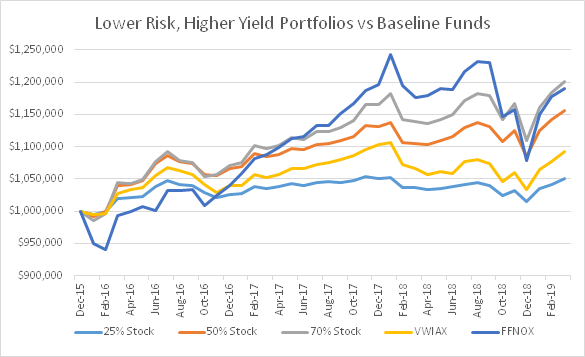 The next three tables show that while the portfolio does attempt to increase yield, the portfolios are well-diversified. With higher risk of recession as suggested by slowing growth and the recent inversion of the yield curve, it is prudent to reduce risk in portfolios. These model portfolios are a possible range of options for the investor interested in a higher-yielding portfolio. As I approach retirement within the next few years, I will be doing more tax planning, particularly with respect to withdrawal strategies and the impact of taxes. CD Ladders, the bucket approach, reducing risk, and increasing yields in a prudent manner are primary methods. 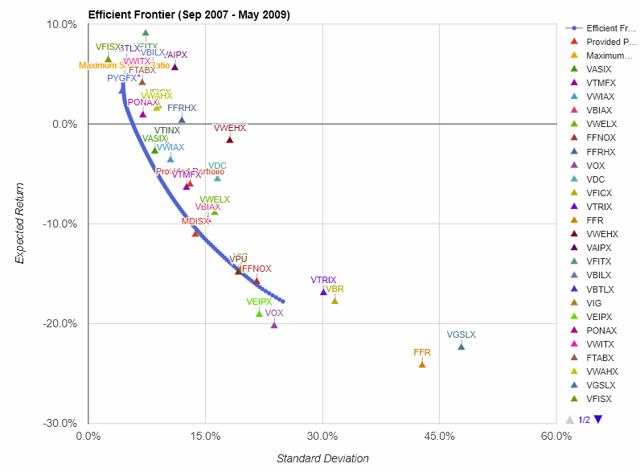 Disclosure: I am/we are long VWIAX, VFITX, FPNIX, FSDIX, FSREX, PONAX, SPLV, VTABX. I wrote this article myself, and it expresses my own opinions. I am not receiving compensation for it (other than from Seeking Alpha). I have no business relationship with any company whose stock is mentioned in this article.